immy, RUBY, TrueSugar and 7 others like this. I am soooooooo happy that you are here in this thread. You are keeping it alive and fully blessed and I appreciate you so very much. Please continue to post and share. You are indeed a loving messenger of God. Yes, you are. loolalooh, luthiengirlie and Lucia like this. God bless you and thank you so much for coming in. loolalooh and AnjelLuvs like this. Bibliophile, Shimmie, Belle Du Jour and 1 other person like this. Dear Lord, help me to find someone I can truly love who will love me as well. Someone with whom I can gladly share my thoughts, my feelings, indeed my life! Someone with whom I may raise a family in accordance with your will to share your love and give you Glory. May he be a vessel of joy in good times and a firm pillar of prudent support in bad. Let neither of us forget that you are there to help us in all cases with your help, guidance, and grace. Let me be discerning and not seek someone solely out of loneliness, but out of love for you and my potential spouse. May this be someone I like as well as love, and may we share a deep bond of trust in each other throughout our married lives, until death do us part. Don’t let carnal or other purely worldly desires cloud my judgment about getting married. Help me to listen to the voice of your Holy Spirit instead in this important matter. Heavenly Father, I ask all these things through Christ our Lord, amen. Chipmunk, Shimmie, Papoose and 8 others like this. Shimmie and AnjelLuvs like this. I think at some point I posted in this thread when I was single. I just wanted to add that prayer is key but I have to say that you must be open to meeting new people going new places basically getting out of your comfort zone. I've seen some folks who met their spouses so easily just going to the store or at work whatever but for me none of that ever happened. I could not understand why I was not one of those folks and one day I realized I had to be more open. I knew one of the most important things to me was a Christian man. I was looking for that but me myself was not even active in the church. It was when I found a church home and started to be involve in church activities and in the word that I met my husband. I did not meet my husband at my church but I believe the reason I met him was because I had a deeper connection with God. It felt right and now I'm married and expecting our first child at 36. Sure I would have loved to marry earlier than 34 but God does things in his time and when he feels we are ready. See it's going to be 2 years for us in October and we are now starting a family. No matter how much you want something let God lead you down his path and plan for your life. Therefore continue to pray and focus on your relationship with God he definitely will answer, maybe not on your time but his. Eta: I remember this prayer. I printed it and taped it in my wall and would read it every night. ColibriNoir, Chipmunk, naijamerican and 16 others like this. Hi my lovely ladies! I always said that I would come back with my update once I got married! I posted December 22, 2013 about trusting in the Lord & delighting myself in Him until it was time to meet my husband. Well, I met him shortly after in January 2014! There were times during the relationship that I would wonder if he was "the one" & then I would get confirmation shortly after that he indeed was. He proposed December 10, 2016 & we got married January 27, 2017! He is a Christian & he loves my kids as his own (the first & most important thing that I asked the Lord for in a man)! Shimmie, I thank you so much for your prayers & encouragement! I wanted to give my testimony to encourage others as well that no matter what circumstances & situations seem like, trust in the Lord with all of your heart! Delight yourself in Him & He will grant you the desires of your heart as His word says! Furthermore, wait on Him & while your waiting, prepare yourself. Preparation is your trust that He will do as He says! Stay blessed & keep trusting Ladies! kimpaur, Kinkyhairlady, Chipmunk and 17 others like this. Congratulations! Thanks for the inspiring testimony. londonfog and Shimmie like this. I am elated for you!!! Congratulations! God's Blessings upon you and your Husband! May he always be fruitful and blessed to care for you always!!! Amen to Jesus... Jesus our Lord and Saviour for ever more!!! Bibliophile, londonfog and Lucia like this. londonfog and Lucia like this. Thank you very much! I cried posting it! I've been through failed relationships where I've chosen a mate that was completely wrong for me. I had to give glory where it's due! SpiritJunkie, Shimmie, Lucia and 2 others like this. Thank you so much Shimmie! Amen & Amen! You don't know how much I appreciate you & the love that you put forth for the ladies here! I read through this entire thread when I first saw it years ago & my spirit was filled by your comments, prayers & encouragement! You prayed for me! May the Lord continue to bless you and your family tremendously & order your steps while you do His work! Thank you again! Shimmie and Lucia like this. It's been such a long time since I've been active in this forum. Today I would like to mark my spot in this thread. This year I made the conscious decision that I'm going fully give my desires for a spouse to the Lord. That also means relinquishing control. Idk God's time table for me. Idk if I'll meet my husband tomorrow or 5 years from now. But I am committed to waiting for this man I have been praying for. In the mean time, my focus is becoming the woman God wants me to be as well as rejoicing in the blessings he has given me during this season. Godsdaughter001, immy, phynestone and 7 others like this. Congratulations and thank you for sharing your testimony! Very encouraging and inspiring. Shimmie, Lucia and londonfog like this. I've been "watching" this thread for a while. I stopped dating someone earlier today. We're both looking to be married and spoke about it, many times. But I took heed to the red flags and ended it before it got to far. Before I got to wrapped up and it was more difficult to leave. I am keeping hope alive. I believe there is someone for everyone. I will continue to work on myself, mentally, physically and spiritually, enjoy life until the right one for me comes to surface. In addition to this, I will prayer as always and keep my eye on this thread for any advice from my sistas. sweetvi, Lucia, londonfog and 4 others like this. Lucia, londonfog and SpiritJunkie like this. Shimmie and londonfog like this. Godsdaughter001 and Shimmie like this. You always share to bless everyone. God bless you with the happiest and most blessed husband and marriage, from God our Father in Heaven. AnjelLuvs and Lucia like this. From your lips to Gods ears. Amen. Godsdaughter001, londonfog, SpiritJunkie and 1 other person like this. SpiritJunkie and Shimmie like this. Thanks for sharing. I'm having a hard time trying to navigate the relationship world. For some reason this recent relation was a toughy. i don't know if it was him or me...or both of us with issues. We're still holding on but we need to let each other go. i think i need some alone time to refresh & reboot myself or speak to an elder at church. not sure what. 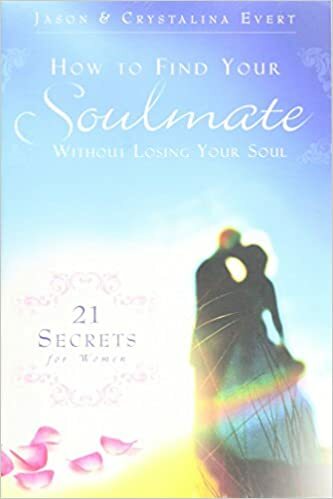 Do we as women, look for the soulmate or live and let them find us? I don't feel like looking for anyone right now. but working on me. londonfog, Shimmie and Lucia like this. The video of the co author describing how he came up with the book above ^^ check it out. This book has helped me a lot, it's geared to all ages from 16+ to adult women out in the world. Next we as women are supposed to be pursued, it's in a mans nature to hunt and find, not ours. It's not our job as women to usurp the mans nature and his birthright given by God to pursue, but we can and should manage his pursuit as in the pace, respect and boundaries. If a true man of Christ is pursuing we as women shouldn't have to set the boundaries alone and him testing us, or not really on board, he should be right there with us, leading us in the ways of Christ. This also goes for going to church, prayer, bible study and worship, charity work, ministries whatever. Christ needs to be your foundation first, while you are seeking Jesus he is seeking you out, and will help heal you, guide you, if you ask and pour your heart out to him. Also of course work on the other aspects of your life physical, work career, school, personal appearance, hobbies, whatever. 21Death and life are in the power of the tongue, And those who love it will eat its fruit. 22He who finds a wife finds a good thing And obtains favor from the LORD. So it's the man who finds favor with the Lord in finding not just any wife but a "good" wife. Proverbs 31 is not only a model of an exceptional Christian woman it's actually it's from father to his son as to what type of woman he should make the lady of his manor. The whole book of Proverbs is dedicated from father to son telling him how to avoid traps trouble and how to live well according to the words of God. I would suggest you read Proverbs 31 and then read a verse or chapter from Psalms, Wisdom, or Proverbs or Timothy each day. I don't know if this is your case (so if it's not your case this is for someone else who may read) but a lot of women in this modern society are afraid deathly afraid of submission to a man, instead they want to low key be the man and wear the pants emasculating him, then when things go wrong they want to blame the man for not stepping up and manning up. Well we should be afraid of submission but submission to the wrong kind of man. That can be prevented if we do our due diligence and rely on Jesus to help us discern the men we are thinking of dating. We are supposed to submit to a godly man and let him lead. Also we need to have our own relationship with God first so that we're not relying on a regular man to meet our spiritual needs, needs no regular man can meet. God bless! londonfog, Shimmie and SpiritJunkie like this. Thank you @Lucia I will read all of what you suggested. The last tip, I am in the mind frame of a man to lead....so this one...a very very good tip but doesn't apply to me. My issue is communication..and not always enforcing my boundaries. londonfog, Lucia and Shimmie like this. londonfog, Lucia and SpiritJunkie like this.